Please enjoy these tracks in their entirety on this website. If you'd like to have your own copy, they're available on ﻿iTunes﻿ and CDbaby. Please enjoy this holiday music in its entirety on this website. If you'd like to have your own copy, it's available on ﻿iTunes﻿ and CDbaby. This page is still under construction, so the following titles may not yet be linked to audio. Please scroll down to hear some recordings from the following projects. I have lots of other pieces in these and other genres, so please ask if there's something in particular that you're looking for. If I don't have it, we can create it. Pieces From "Notes From The Pilgrimage"
Solo Piano Pieces From "Pianoworks"
"Never Try On His Name"
Some Pieces From "Notes From The Pilgrimage"
"Notes From The Pilgrimage" is a collection of pieces for piano and chamber orchestra. 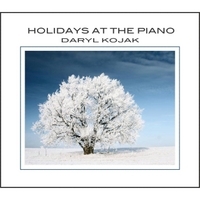 Some Solo Piano Pieces From "Pianoworks"
"Pianoworks" is a collection of Daryl Kojak's original compositions for solo piano, available in print form. "Prelude In C Sharp Minor"
"I Always Come Out On Top"
(If You Don't Go Home Today)"
"I'm Not Giving Up On You"
"Dancin' With My Shadow Again"
"A Mother - Hook's Reprise"
Music and Lyrics by Daryl Kojak unless otherwise noted. Tango in F Sharp Minor Copyright ©2014 by Daryl Kojak. All rights reserved.